A bare and boring deck didn’t entice anyone to head outside to relax — but a dramatic makeover turned it into the perfect outdoor retreat. Of course, all you really need to sit down on the deck is a chair. But this bare, exposed deck certainly didn’t offer any reason to go out there, let alone an excuse to linger and enjoy the outdoors. Although the deck is on the east side of the house, there’s little shade, so it was hot until late in the day. Worst of all, a wedge-shaped lot meant that the house and deck are very close to the neighbors’ houses, so there was no privacy at all. As we worked on this makeover, we wanted to be sure we addressed several important issues: First, add some screening for shade and privacy; second, dress up the deck with plantings and containers to make it visually pleasing, and third, make sure that we arranged the furniture to make the best use of the small space. Too much exposure — to sun and to the eyes of neighbors — made this deck an unappealing place to be. But just look what our makeover did for this space! 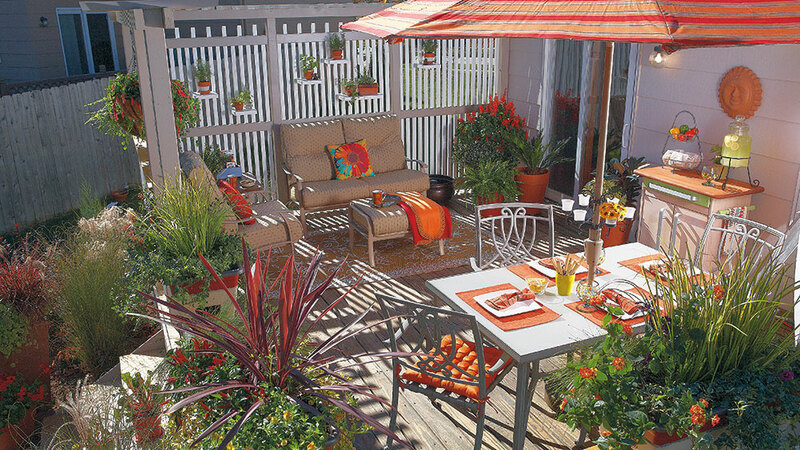 We’ll walk you through the process, starting with simple construction fixes to improve the appearance and traffic flow of the deck, and moving on to how we chose furnishings and plants for a cheerful outdoor space that really does invite you outside. 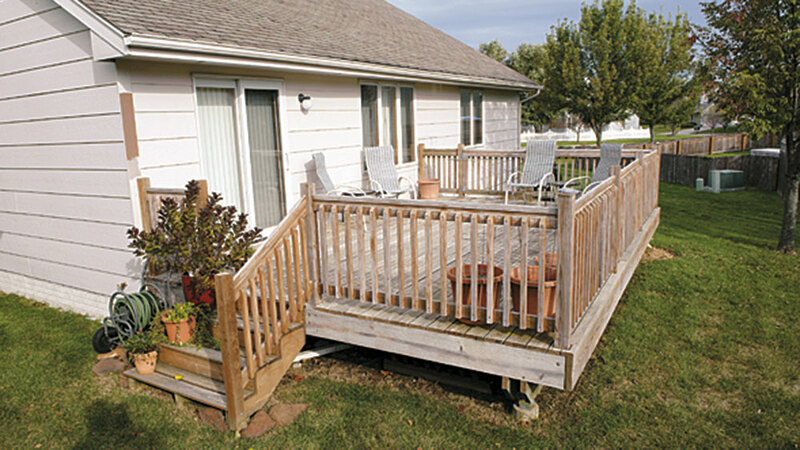 Even a small deck, like this 14×21-ft. one, allows you to create a gorgeous outdoor retreat. Located right outside the kitchen, it’s perfect as an outdoor dining space. But you want it to be comfortable, too, whether you intend to sit around the table with friends after dinner or just head outside by yourself to relax after a long, hard day at work. As we planned this makeover, we considered all the possibilities: how to improve the deck itself, which furniture to choose and how to arrange it, what to plant around the deck, how to provide shade and privacy, and what finishing touches would make this space warm (or cool!) and welcoming. This sketch shows you some of our initial ideas. Read on to find out what we actually did. 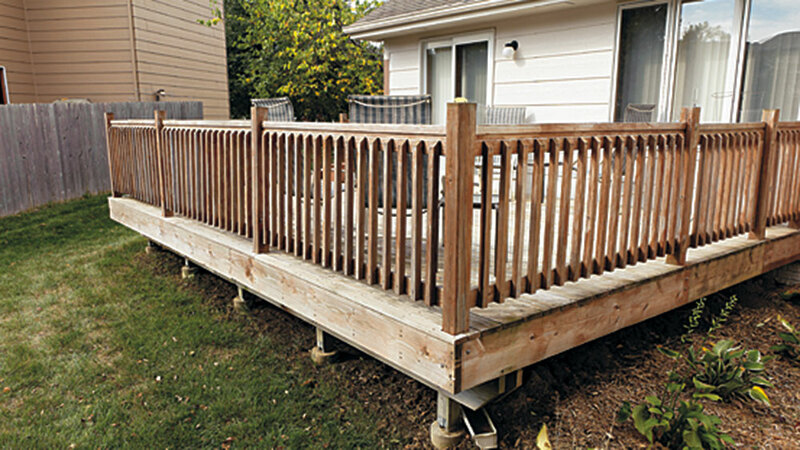 The extra height of a deck, raised above the ground, makes it especially hard to screen. Even a tall fence won’t offer much privacy, and waiting for trees or shrubs to grow takes too much time. A privacy screen would fix the problem quickly, while adding a little shade, too. When you step down off the deck, it’s nice to have a hard surface for a “landing.” Cut limestone squares or square concrete pavers, spaced a couple of inches apart, would add a bit of flair and visually extend this small deck a bit. A privacy screen would add a little shade, but this deck could still use some more. There would be plenty of anchor points to install a shade sail for extra shade. Shade sails, essentially triangles or squares of sun-resistant fabric, add a clean, contemporary look to a deck or patio. Even though the main activity for this deck will be an outdoor dining spot, it would be nice to have a couple of comfortable chairs to lean back in. Wood or composite Adirondack-style chairs would echo the construction of the new privacy screen on the left. Many home‑owners like to have the grill up on the deck, close to the kitchen and the outdoor seating. But there are a couple of safety tips and products to keep in mind. 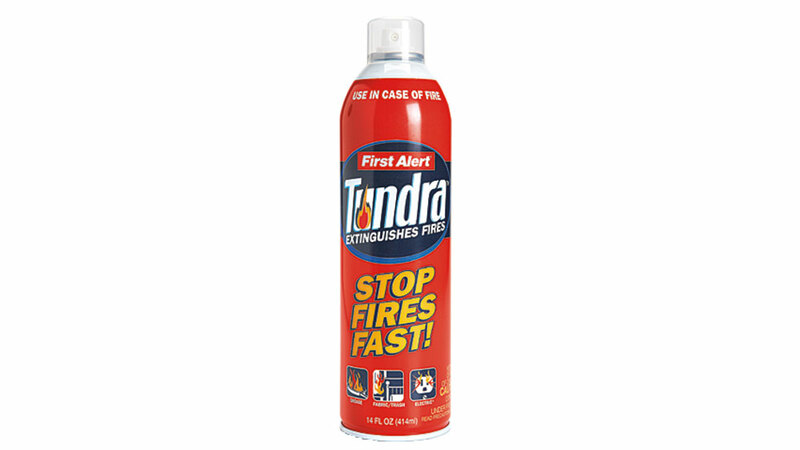 Always keep a fire extinguisher nearby (like the handy aerosol extinguisher above). 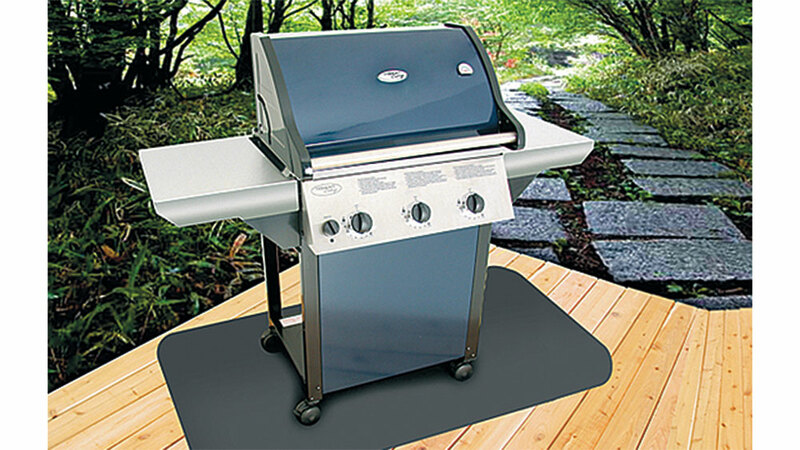 A fireproof grill mat protects your deck from sparks and spills. (They’re available at big box stores.) And of course, keep fabric, plants, children and pets away from the flames. With no plantings around the base, a deck seems to float in midair. That makes it feel disconnected from the rest of the yard, and it also means you get an eyeful of what’s under the deck every time you’re out on the lawn. Here, a mix of shrubs, grasses and perennials would dress the deck up, tying it in to other plantings in the yard. It would also hide that under-the-deck area from sight.